You are here: Home / Featured / Shark Attacks, Global Warming, and Climate Change – Can They Be Connected? Shark Attacks and Climate Change – Connected? In recent times, Australia had five incidents of unprovoked shark attacks in Western Australia alone. In South Africa, two casualties resulted from five similar accidents. In Reunion, a French island, two out of 4 shark attacks had been fatal. Two such reports had also emerged from the Seychelles, and both had fatal results. Nonfatal shark attacks had also been reported in Brazil, Russia, Mexico, and the Indonesia. Of the various countries named above, Seychelles and Reunion are not considered as “traditional” areas of shark population. One reason to explain the unnatural increase of shark attacks in these areas would be climate change or global warming. 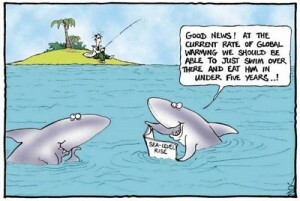 Sharks go where the food sources go, too. If the latter opts to migrate for lower temperatures, then it may be inevitable for sharks to do the same, hence the prevalence of attacks in areas where sharks are not even normally seen. Experts believe that many other factors have contributed to the increasing number of shark attacks in recent times and especially in areas where such incidents had not been prevalent in the past. * Areas where rates of shark-related incidents have unexpectedly increased may be presently ill-equipped to handle resulting medical emergencies. * Various reports have shown that more people are spending their time on water sports and activities. The amount of time spent on such activities has also increased. For these reasons, it’s not surprising that the likelihood of encounters between sharks and humans would also increase. Even though a good amount of research is still necessary to determine the actual cause behind the expanding area of shark-infested waters, experts believe that people don’t need to wait for the results in order to implement effective measures against unprovoked shark attacks. What the United States has done to protect its locals and tourists is a commonly cited example where safety measures against shark attacks are concerned. Above all costs, many experts believe that shark killing is not the answer. Although the numbers of fatalities caused by shark attacks may have continued to increase, such figures are nothing when compared to the thirty to seventy million sharks caught and killed each year for profit. * Avoid swimming alone or when few people are around and in low-visibility areas. * Avoid swimming with schools of fish. Doing so may cause their pattern of movement to change, which could cause sharks to launch a premature attack. * If you do spot a shark nearby, avoid thrashing needlessly or panicking in the water. Unnecessary and excessive movement will only attract sharks more.